It’s one thing to know that your chimney needs repairs. 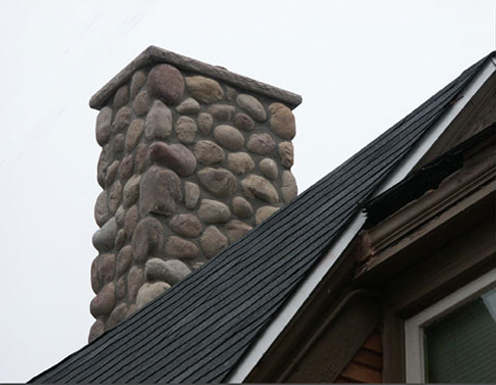 It is quite another to when you have stone chimney repair is needed. First things first, have an inspection and estimate done. This will help you determine the extent of the repairs needed to keep your family and home safe from fire. Can you just reline a stone chimney and call it good? To listen to some of the DIY sites you would think that stone chimney repair can be done quickly just by installing a liner. There is no part of a chimney that can function on its own. Stone chimneys are integrated elements and each part of it – from masonry to liner to cap flue – must be in good working order. Always have your stone chimney inspected so you know what work really needs done. It is not usually recommended to do your own repair work but to have a professional company like us at Dayco General Inc. do the work. Stone chimneys aren’t just complicated, but the safety of your home and family depends on their integrity. The different types of liners used. There are three different stone chimney liners that are used for relining and new construction. They are: Clay, Steel, or Pipe. Each one has its advantages and not all of them can be used in the same situation. If you are considering switching to an insert you should know that even inserts need to have a chimney liner. Another important aspect to consider is that steel and pipe liners require additional fireproof insulation placement. Don’t go by the raw price of the liner in making your decision, go by the full estimate so you know what is really involved and what it will cost. What about switching to an insert? We can help you to select the right insert for your fireplace if you want to switch. Switching over to an insert can be a great way to reduce your heating costs without losing the beauty of having a fire. There are many different insert types and styles available. One of the key aspects of knowing which one you need to select is the availability of fuel in your area. Just putting in an insert doesn’t get rid of the need for exterior repairs, although it can reduce the extent of the repairs required. Making sure you know what is really involved. Here at Dayco General, we’ll make sure you understand what is really involved in the work. Don’t be afraid to ask questions, we take the time to help you understand the repairs that need performed and allow you to make the best decisions for your home.